Submissions are accepted via email at AtlStudies@gmail.com and reviewed by the editorial board. Emory University’s Center for Digital Scholarship (ECDS) is hosting a new website, AtlantaStudies.org, to bring together research projects, resources and information about the Atlanta metro region and inspire new scholarship. AtlantaStudies.org, which launched Feb. 16, is an open-access online publication that features original writings and projects about the Atlanta region, resources for the region, and events such as quarterly meetups and an annual Atlanta Studies Symposium. The publication is a collaborative effort, with editorial and advisory board members from organizations and institutions across the region and the country, and it aims to engage audiences both inside and outside the academic world. Atlanta Studies is not just for those in the academic arena, but for members of the public as well, says editorial board member Ed Hatfield, an ECDS graduate fellow in digital humanities and PhD candidate in history at Emory's Laney Graduate School. “We want to bring academic scholarship to the public at large and to make a contribution to Atlanta’s media landscape, so people who are interested in history and politics can have a new source for commentary, analysis and information,” Hatfield says. This screenshot shows the projects and resources available to members of the public as well as to academics. The section is expected to expand as the new website takes off. The website publishes original scholarship on a monthly basis; the first article is Boyd Lewis’ “Living at Peggy’s: Where Margaret Mitchell Wrote ‘Gone with the Wind,’” an insightful telling of the history of Mitchell’s famous apartment, including a first-person account of the period when Lewis occupied it. Blog posts such as Scott Libson’s “The Lost Picture Show: Remapping the Cinema Landscape of Segregated Atlanta” – about the work of Emory professors Dana White (emeritus) and Matthew Bernstein using ECDS’s forthcoming Digital Atlanta Geocoder mapping system – will appear on a regular basis, Hatfield says. “We’re always looking for new and interesting voices, and we’re really excited about what we’re starting out with,” says Sarah Melton, ECDS digital projects coordinator and a PhD candidate studying public history at Emory. Submissions are accepted via email at AtlStudies@gmail.com and reviewed by the editorial board. AtlantaStudies.org also offers a gateway to several projects and resources. Current featured projects are the ECDS’s Battle of Atlanta smartphone-accessible tour; the Peoplestown Project, about the historic neighborhood and its community-based organizing legacy; and the Inman Park Squirrel Census, with findings and often humorous stories from its “census” of the Eastern gray squirrel in an urban neighborhood. 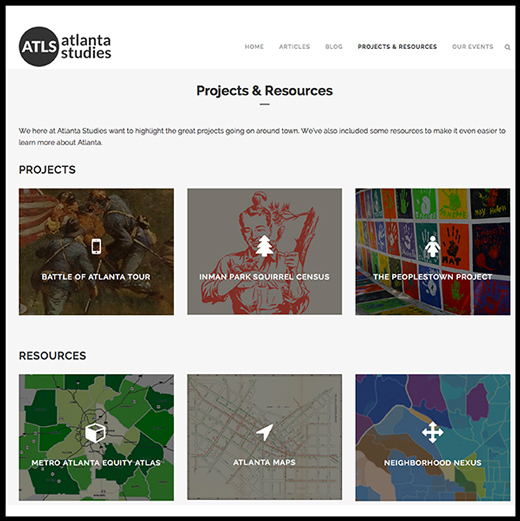 Resources include access to historic Atlanta topographic maps, as well as to multiple Atlanta maps related to demographics, regional planning, economic development, education, public health, housing and transportation. The online publication is an outgrowth of the Atlanta Studies Network, a group formed in 2012 by former ECDS digital scholarship coordinator Stewart Varner and Brennan Collins, associate director of Writing across the Curriculum and the Center for Instructional Innovation at Georgia State University. The group’s purpose: to bring together people engaged in their own research about Atlanta. Group members’ projects often pertain to community development, socio-economic issues, transportation and infrastructure, urban design, and labor and unemployment. Group members now number about 200; this year’s symposium will take place at Georgia Institute of Technology on May 6. The editorial board includes people from Emory, Georgia State, and Kennesaw State universities; the Atlanta History Center, and Atlanta Studies co-founder Varner, who is now at the University of North Carolina at Chapel Hill. Representatives from the Auburn Avenue Research Library, Emory and Georgia State universities, and Atlanta Magazine comprise the 11-member advisory board. Hatfield says although Emory publishes the site, it’s the cooperative nature of the project that makes it work.